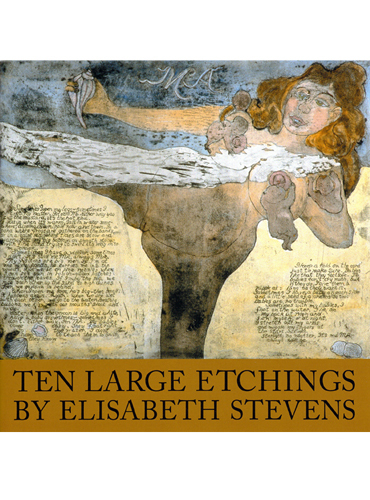 The ten large and imaginative etchings pictured and documented in this catalog were created by Elisabeth Stevens from 1989 to 2006 on 22×28-inch zinc plates and 31-inch diameter copper rondos. All were hand printed in small editions. They often picture energetic nudes influenced by figures from Classical Greek vases such as the sensual MA on the catalog’s color cover. Other works involve dream memories such as: When I Was Three, I Flew Across the Front Parlor Over Their Heads or ironic commentaries such as the Death of Santa Claus. Three strange, metaphorical rondos depict Chaos, Metamorphosis, and finally, Apotheosis. Always, these are highly original works in which imagination runs rampant.